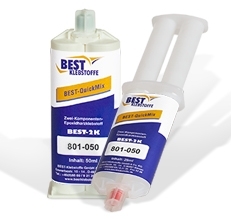 BEST-QUICK MIX 801 is a 2-component all-purpose adhesive for bonding of a multitude of materials, e.g. various metals, ceramics, glass, wood, rubber, hard plastics as well as most commonly used materials. The product is of medium viscosity with good flow ability. It is tough-elastic with high tensile shear strength.